Most Important Task (MIT) is a task that sets you on the path towards achieving your goals. Boost your productivity using the MIT-s Task Management Method. Do you feel that your life has become an endless to-do list with tasks? And it gets longer and longer no matter how much time you spend working on those tasks? Are your tasks like the Hydra from Hercules – once you finish one, three new ones come in its place? Do you spend most of your day getting one “urgent” task done after the other? If yes, then you badly need task management skills. Task management means managing a task through its life cycle – planning, testing, tracking and reporting. They help individuals achieve their goals and groups to collaborate and accomplish collective goals. Tasks have different complexity (from low to high), different priority (from low to high) and different urgency (from low to high). Most Important Tasks (MIT) is a method for task management of selecting the most important tasks for the day and making sure that they get done. This way you can concentrate on the tasks which would bring the most value to you. Time to read: 12 minutes (based on 150 wpm). Let us start with examining the different dimensions of tasks. Trivial – all tasks that you can accomplish under 2 minutes. Writing, prioritizing and tracking such tasks is more expensive than just doing them right away. Easy – minimum brain power needed. Such tasks usually are: replying to an email; reviewing emails; tracking and updating the To-Do list and so on. Most often, they require no or low coordination. Moderate – some brain power needed, but not so much as to put you in your flow state. Those task require coordination of more than one skills to accomplish. Examples for such tasks are: writing the CRUD methods of a new class (for the IT nerds out there); copy/pasting cells from Excel and controlling the values; analyzing a balance sheet. Difficult – coordination of more than a few skills, with a creative element. Usually you have to reach beyond the known to accomplish these tasks. Examples: inventing a new algorithm; writing an article; drawing in AutoCAD. Next week – everything that could be done next week (this means it should not be done during the current week). The consequences of not doing the task during the current week are negligible. This week – everything that should be done within the current week. Those tasks could slip to next week, but it is not desirable. Tomorrow – these are the tasks that would be urgent tomorrow. If possible, you should also try to do them today. Today – the tasks due today. NOW – I was tempted to leave that out, because there should not be such tasks if using MIT. These are the “hot potato tasks”, that should be resolved immediately. All men are created equal, but all tasks are not. There are some tasks with higher priority than the others. I say this again and again, but please use all priorities! If you have 5 tasks with priority 1, you could also stop using priorities. Minor – these tasks are usually last on your to do list. For example: getting the dry cleaning, updating the knowledge base, generating a document. Critical – very important tasks, but not necessary blocking somebody else. Blocker – those tasks block another individual or group from doing what they need to do. Doing them would allow your colleagues to do their jobs. Tasks could also have other dimensions, like for example the project to which they belong, the type of task (personal or work related). Writing down new tasks as they come. If possible, also evaluating their dimension values (complexity, urgency and priority). Updating old tasks and adjusting their values. Deleting or otherwise marking the completed tasks. I usually use Jira for tracking my work-related tasks. It is lightweight and easy to administer. In Jira I track tasks by project, type (research, bug, task, dev task) and by priority (from trivial all the way to immediate). I also use it for reporting the time I’ve spent doing those tasks and issue invoices. I track my personal tasks in Evernote. Following the principle Keep It Simple and Stupid (KISS), I have weekly notes for the tasks that need to be done during this week and daily notes for the most important tasks (MIT). There will be more on the subject later. In order to be as productive as possible, I am using the Pomodoro method for time management. For more information you can check out my post about that method: Time Management: Using Pomodoro Technique. A Most Important Task (or MIT) is a critical task that will benefit you the most and its results will contribute the most to your goals. You can have any criteria you want for selecting those task, the key it to be consequent and true to yourself. Usually, you have higher energy at the beginning of the day than at the end of it. For me personally, my energy levels somewhat decline after lunch and completely disappear after 4:00 PM. So it makes sense to aim at the most important, complex and highest on the priority list tasks in the morning. If you follow this pattern, you should never have an urgent and complex blocker task, because you should have already taken care of it. If you select 2 or 3 MIT-s at the beginning of each day, then you should really see a productivity boost after just a few days practicing the method. When should you select your MIT-s? I usually start the busy part of my day with defining 3 MIT-s of the day. If you want to learn more about my whole morning routine, please check this article: Practicing Discipline – The Ultimate Daily Routine for Entrepreneurs. I select my MIT-s before checking email so that I don’t let others influence my choices. Remember one more time, the MIT method is all about getting the most important stuff done first! That stuff that is going to have the highest impact on you, your goals, your team or anybody that depends on you. How should you select your MIT-s? As I already said, I have a list with weekly tasks, that I use as a task pool or a ToDo list. I update that list at the beginning of the day by crossing out the completed tasks. Then I update the urgency of the remaining tasks. Those that were labelled as “tomorrow” yesterday, are not “today”. Hopefully there are not tasks labelled as “now” that are still not finished or at least started. From that list, I usually select 1 or 2 work-related tasks, those that would benefit my work situation the most (my customer, my current employer and so on). I am very goal and task oriented person, so most of the days I just list the projects on which I decided to concentrate. If there are more than 1 sub-tasks related to that project, I also list them in brackets. I ALWAYS select at least 1 personal task that would help me move forwards with MY current goals. I find this step very important, because even during the busiest of days, I keep focus on my long-term goal(s). And I make sure that I spend some time on tasks that are going to contribute to MY goals. The list is prioritized from 1 to 3. The first item is the most important task at work, depending on project schedules, stress from the management and so on. The second item is when two projects need to run in parallel and also depends on project schedule and other factors. If there is no second work tasks, I put my first personal task as the second item. My third task is always personal and is aligned with my long term goals. Like everything else in life, the list is not immutable and could be changed. Use another simplified list below your MIT list to track any changes or generally notes. Even if I make changes, I keep the old value with strike-through formatting (example) so that I know which task was there before the change. Another very important part of task management. I always update a third list in my daily MIT note in Evernote with results. Did not have time for that, because of the other tasks. I revisit my daily MIT-s at the beginning of the next week and draw conclusions and optimization proposals. I keep the list sorted by project, ordered by priority within the project and in brackets I keep the complexity and the urgency of the task. 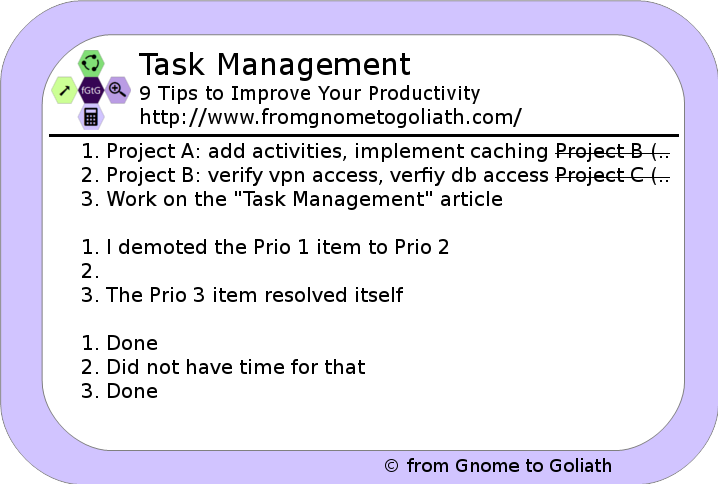 For example, my first task on the list has Prio 1 among the tasks from project 1. It is easy to accomplish and the deadline for it is the end of the week. When looking for daily MIT-s, I make a judgement call and pick the most “important” tasks. I see this as a mixture of priority, urgency and a subjective factor – importance. When all my daily MIT-s are done, I usually go through the projects from top to bottom and pick tasks from there. If I do not have time for a full pomodoro, I just get an E task. You are not living in the ages of the conveyor belt (invented by Henry Ford) where you only have one repetitive task for the day. You are living in a world of constant demand, constant change and among tens of tasks which demand your attention. Learning and mastering task management leads to tremendous productivity boost that your will feel it not only in your work life, but also in your personal one. 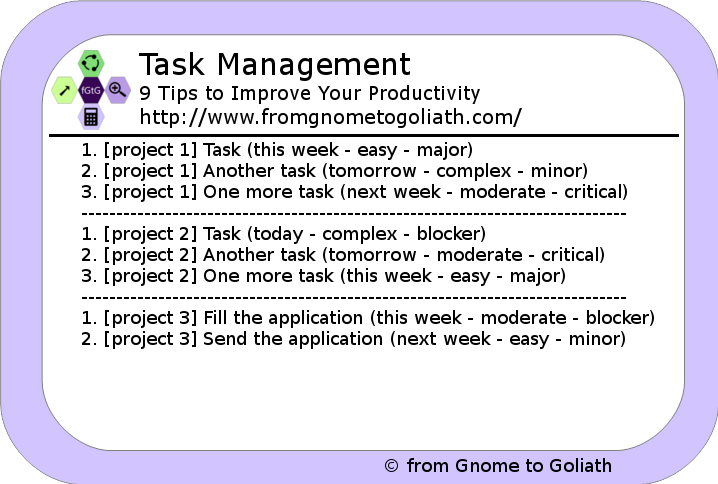 One of the most useful methods of task management is the MIT method (or most important task). It urges you to concentrate all your effort on those tasks that would bring the highest value for your life. The method presented in this article goes one step further and instructs you to pick at least of of your MIT-s that directly contributes to your personal long-term goals. This way you ensure that you will be getting a few hours closer to your goal each day.